That is the view of north Northumberland farmer Karen Burn, ahead of Tuesday’s deadline on a major Government consultation on plans for agriculture after the UK leaves the EU. 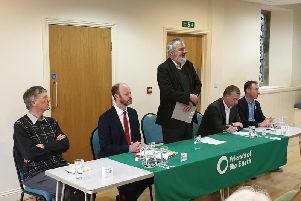 The consultation – entitled Health and Harmony: The Future for Food, Farming and the Environment in a Green Brexit – sets out a range of possible paths to a brighter future for farming. Earlier this year, a group of more than 100 farmers with a new vision for the future of British agriculture launched the Nature Friendly Farming Network (NFFN). The independent organisation is calling on the UK and devolved governments to create a post-Brexit framework that will help farmers restore British wildlife, reverse declines in soil quality and help manage the impacts of climate change, at the same time as growing affordable, healthy food. NFFN says that leaving the EU’s Common Agricultural Policy necessitates a new approach to British farming policy and believe it should be an opportunity to help farmers across the UK transition towards a nature-friendly future. And Karen Burn, who farms at Hunting Hall – a small, traditional family farm between Lowick and Beal – supports this approach. The farm has arable land, rare-breed pigs and a small flock of organically-managed sheep, and over the last 10 years, the family have farmed with sensitivity towards the environment to enhance the countryside for wildlife. Karen, married to Tom, said: “We support nature-friendly farming to increase farmland biodiversity and encourage more people to explore the countryside the way we used to. Over the years, the family have taken numerous approaches towards nature-friendly farming. Overall, they have planted more than 3,200 trees and 2,700m of mixed hedging on the farm. In 2002, they began a year-long project with Belford Wildlife Watch Group called The Great House Sparrow Rescue. The group looked at possible causes for the sparrow’s declining numbers and worked to improve habitat and food provision on the farm through various methods, including new bird boxes and tables and creating a feeding centre and hide. Their daughter, Meg, won Young Environment Champion of The Year 2001 and was awarded funds which she contributed towards the creation of Meg’s Wood and Pond – helping to attract insects and birds. Karen said: “The farm has become a haven for wildlife and today we see a great deal more biodiversity on the farm than we did in the 1970s and 80s. Reflecting on Brexit and the consultation, Karen said: “It is a chance for farmers, environmental experts and nature trusts to raise their combined voices and ensure government support continues, so that farmers can create a countryside of which we can all be proud. “Farmers need subsidies that reward them for caring for the environment and improving wildlife habitats, while earning a living from the land.